We are very happy to announce that BoldMinded has acquired Bloqs from Q Digital Studio! Bloqs is a fantastic add-on that revolutionizes how you build sites in ExpressionEngine. We couldn't be more pleased to be its new caretaker. To celebrate, we’re happy to announce that Bloqs is now compatible with Publisher 2. This has been the most requested feature for Publisher (and possibly Bloqs), and it took some time to pull together. Now that both add-ons are under the same roof we can ensure that they work together seamlessly. In fact, this is not the first time Bloqs has worked with Publisher. A custom version of Blocks and Publisher for ExpressionEngine 2 have been running on a large site for nearly a year. We expect the stability to continue with Bloqs and Publisher 2 for ExpressionEngine 3. Publisher 2.5 and Bloqs 3.1 are available to download from boldminded.com. Existing Bloqs customers can still get 3.1 from Devot:ee. Bloqs will remain Bloqs. Its current feature base is very solid and will not change, but for the immediate future nothing huge is planned. We do have some ideas, based on customer feedback, and through our own usage of Bloqs, for some enhancements that we would like to implement in the next few months. The highest priority is the ability to nest blocks with rules to define parent/child relationships between blocks. Effective immediately all new Bloqs license purchases will be done through boldminded.com. Existing licenses from Devot:ee will be imported into boldminded.com in the coming days. Until the import is completed the latest version of Bloqs will still be available for download from Devot:ee. Bloqs’ license renewal will change from 6 months to 1 year to be inline with all other BoldMinded add-ons. This should retroactively apply to all licenses purchased on Devot:ee once the import is completed. eebloqs.com will remain the canonical source of information and documentation about Bloqs for the foreseeable future. License downloads, purchasing, and change-log will be moved to boldminded.com. Oh, and one more thing. 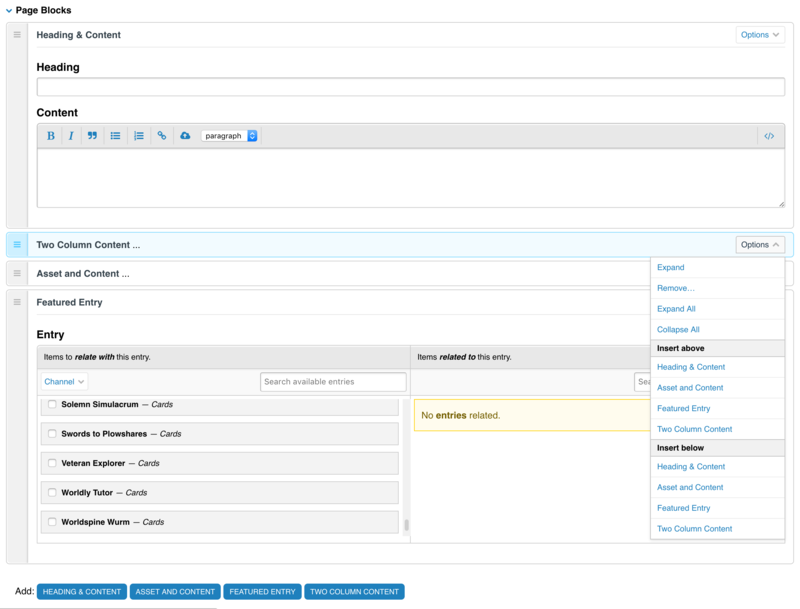 As part of this release Bloqs gets a new, fresher, and ExpressionEngine 3 compatible makeover. Enjoy!